Nothing beats enjoying the luxury of a proper sauna in your own home. The popularity of saunas exploded in the recent years, as various companies started offering their clients everything that they need to set up one at home. There are now a great many deal of types of saunas to choose from: dry saunas and wet saunas, wood and salt-based saunas and so on. Just try each type out, decide which is your favorite and the world is your oyster! The only thing left to worry about once you decide on the specifics of your sauna layout is the heating. You need a reliable source of heat in order to power up your new miracle chamber. But what is the best one to choose? Should you go for electric or gas-based? What capacity is optimal? What brand is more durable? To help you get the best sauna heater for your particular set-up, we’ve put together this guide on everything there is to know. Finlandia is a cult brand when it comes to saunas and home heating systems. If you’re looking for a top rated electric sauna heater, this one is it. 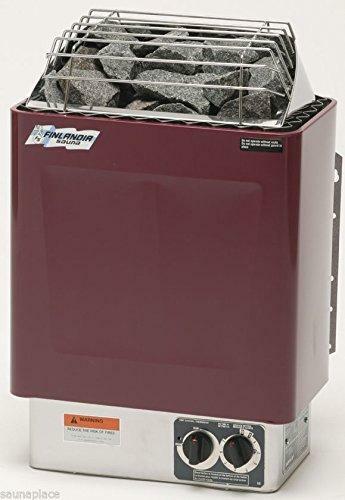 It’s small but powerful, and it includes all the necessary sauna rocks for a lasting warmth. 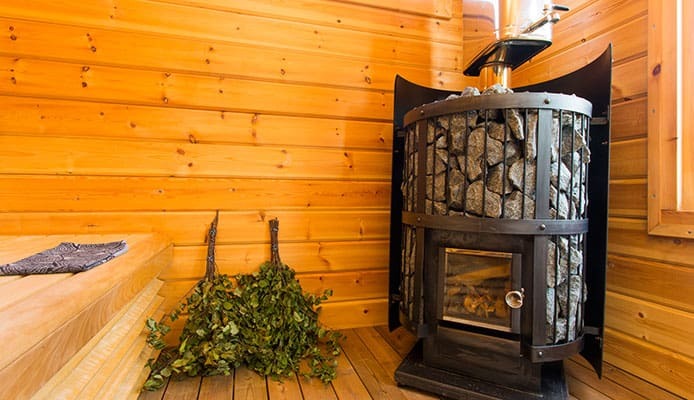 It’s made in Finland, following traditional sauna stove techniques but made from state-of-the-art stainless-steel interior and heating elements. The controls are easy to use, built into the base of the heater, and they allow you to preset the future starting time of the heating several hours ahead. Imagine coming home after a long day to find the sauna ready to welcome you into the perfect relaxation session. What more can one ask for, right? Are you a fan of traditional saunas? No problem, so are many of us! 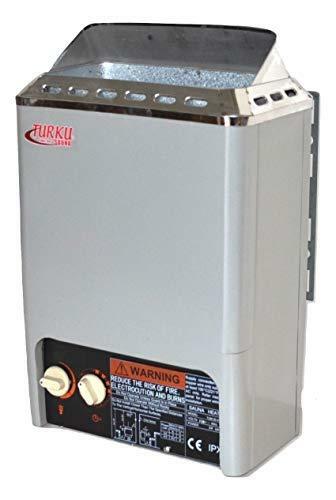 For all proud owners of traditional saunas, this Turku device is the best electric sauna heater. It allows you to enjoy all the benefits of a traditional Turkish sauna with the convenience of modern controls and features. This home sauna heater is rather small so it can satisfy even the most challenging space restrictions. If you can’t decide on preferring a wet sauna to a dry sauna and vice versa, the good news is that this heater allows you to enjoy both. The hot stones it comes with allow it to function just like a steam sauna heater: whenever you want to turn it from dry to wet just sprinkle water on the hot stones. This one is a great option for those who prefer a dry steam sauna. The elements are crafted from a high-quality aluminum alloy and stainless-steel. This steam sauna heater can work its magic quickly and the controls allow you to adjust the conditions to your liking with no fuss. 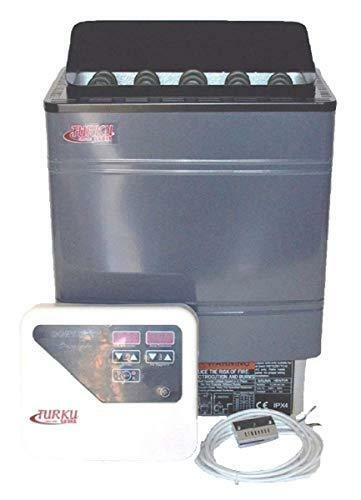 It’s the best sauna heater for those shopping on a budget, but who still expect their sauna stove to be reliable and performant. Another great home sauna heater from Turku, compatible with traditional saunas only, since it’s crafted following the classic Turkish model. This one is perfect for bigger sauna rooms, since it can heat up to 250-450 cubic feet of space. If you treated yourself to a lavish multi-person traditional-style sauna room, this is the ideal sauna stove for it. You can use it for wet and dry heating, too! 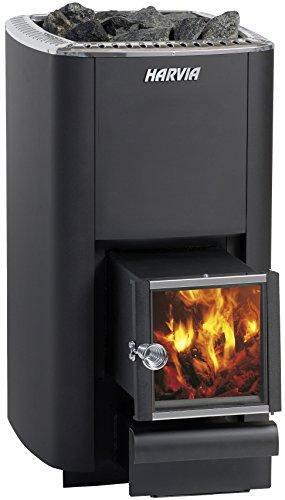 Looking for a classic wood burning sauna stove? This is a great option for all those who prefer traditional sauna heating methods. It’s designed by Finnish brand Harvia, with all the know-how and care of the Nordic sauna stove traditions. It’s the best sauna heater for a small sauna room, heating up to 65 and 140 cubic feet of space. It includes the genuine Harva sauna stones, and the metal and stone which compose it are not just durable, but also very classy. If you own an Aleko sauna, this is the best sauna heater for you, as the Coasts brand was designed to be perfectly compatible with all Aleko products. Still, rest assured that it’s also compatible with other sauna brands as well, for most small to medium saunas. This home sauna heater is certified for energy efficiency, so if staying green is among your concerns, this device will not cause you to worry. It also has a temperature safety cut off built in, so it will shut down automatically in case something goes wrong and the sauna overheats. 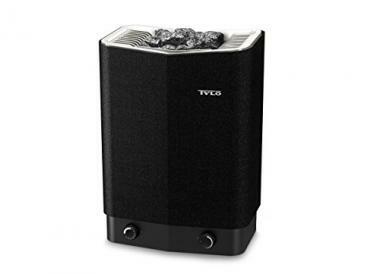 One of the best sauna heaters for large sauna rooms, this Tylo Sense model is suitable both for commercial and for home saunas. It can effectively heat up to 420 cubic feet of space, making it enough for even the most generous saunas. 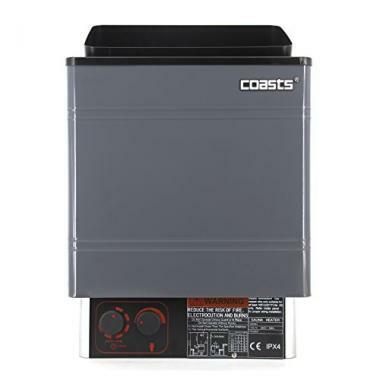 The mechanism is protected by a thermosafe casing and comes equipped with built-in thermostat and timer controls. You’ll be able to enjoy a top-notch sauna experience and adjust all its variables from your fingertips. Also, the materials and craftsmanship are so high-quality that you can be sure you’ll enjoy your sauna stove for a long time. Finally, if you think the best sauna heater for you is one which runs on gas flame, then this one is for you. This super-powerful sauna stove can reach up to 40,000 BTU and uses liquid propane gas as fuel. If you’re impressed with the power of such a gas sauna heater but you’re worried about safety, don’t be. 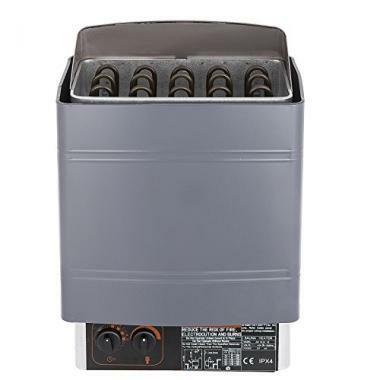 The 240-Vico Ultra comes with a built-in cut-out that will cause the heater to shut down if it becomes overheated. Also, the stainless steel that encases the heater was designed to withstand high temperatures without getting damaged. You can be sure that this is a good option for the long term. Here are the main aspects to pay attention to before making the final decision. There’s a lot to be said in the debate regarding an electric vs. wood-fired sauna stove. Each type has its own advantages, so there’s no right or wrong choice per se. What you need to decide is which one is better for your current needs and sauna set-up. In our opinion, an electric sauna heater is more convenient for those who lack the time and dedication to maintain a traditional sauna stove. 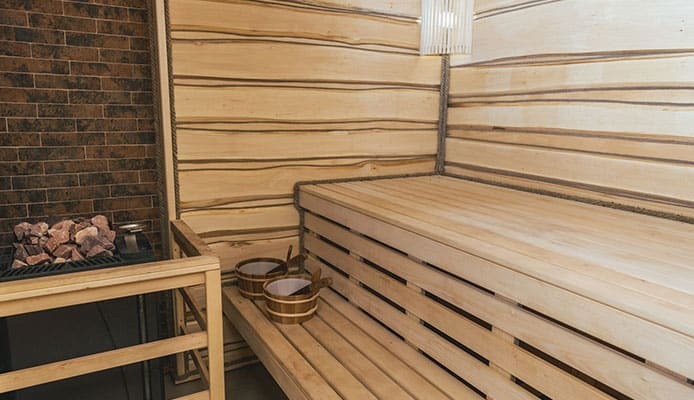 On the other hand, if you don’t mind doing a bit of extra work but you really admire the Nordic way of life and what the whole sauna culture is about, then a wood burning heater for sauna is ideal for you. While there’s no question that all saunas have their own proven health benefits, an infrared sauna takes it up a notch. There’s even evidence that an infrared sauna can help you fight cancer, diminish signs of ageing, boost your metabolism and vitality and much more. So, since an infrared sauna heater can contribute to the general wellness points of your sauna, we’re naturally all for it. However, bear in mind that the maintenance for such a sauna heating device can be a little more complicated than the one required by more traditional models. Should anything start malfunctioning, the repair costs necessary for an infrared heater for sauna can be steep. There are two aspects to consider here. First, there’s the matter of its own size: the best sauna heater for you has to fit in your home without ruining the design of your spa room. Secondly, there’s also the size of the room it can heat. 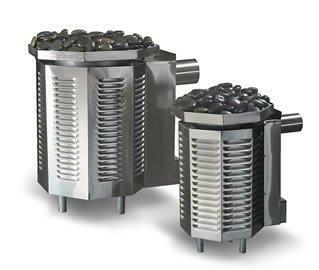 Most sauna heaters mention in their product specifications that they can heat up a certain amount of cubic feet. If your sauna room exceeds that number, that means the sauna stove is too weak for your needs. The power of your sauna stove is measured in stone capacity. 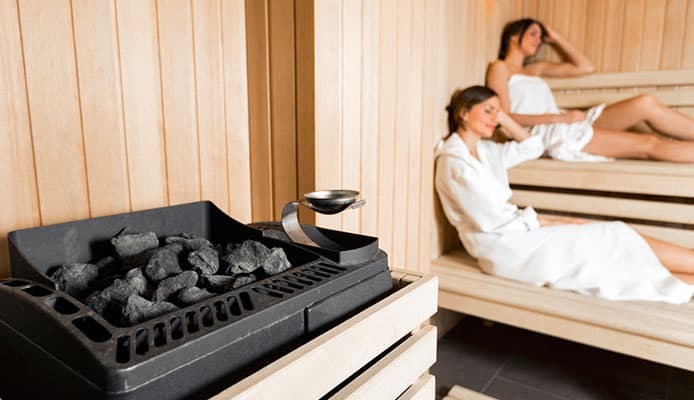 It means the sauna heater is capable of heating up a certain weight equivalent of sauna stone material. The higher this number is, the more powerful your sauna heating device is. Obviously, in today’s age of hurriedness, everyone wants their sauna to heat up as fast as possible. It’s true that the best sauna heaters are able to go from zero to max in less time than their less performant counterparts. However, bear in mind that the faster your sauna heating unit fires up, the less durable the heat will be. Sauna which take a longer time to heat are made from materials with more temperature inertia, which means they stay hot for a longer time. If you’re not sure if your home sauna heater is fast or slow, or if it’s working as it should, don’t forget that you should measure its performance with a thermometer. All home saunas need to be equipped with sauna thermometers for safety reasons, anyway. Last, but not least, remember that you need to consider the difficulty of set-up before deciding on the best sauna heater for you. Do you want to install it by yourself? If so, look for one who promises an easy install. But, if you prefer to let a professional do the work anyway, then the complexity of the set-up shouldn’t weigh in your final decision. Q: What Is The Difference Between A Infrared And Electric Sauna Heater? A: Just because these two types of sauna stove don’t use wood as a fuel doesn’t mean they are the same. An infrared sauna heating unit will use electricity as its source of power, it’s true, but it is capable of heating the human body at a much lower surrounding temperature. An electric sauna heater, on the other hand, will need to heat the air around your body first, in order to heat you up afterwards. Infrared sauna heaters have their own health benefits as extras, but don’t go well with water or humidity, so they are only suitable for a dry sauna. Q: Are Sauna Heaters Safe? A: One of the main concerns of sauna designers and sauna stove manufacturers is the safety of people using their products in their home. So, the answer to this FAQ is that they are perfectly safe, but only if you choose a high-quality product from the list of the best sauna heaters. Go only for reputable brands which offer guarantees and make sure you read some other sauna heater reviews for the model you’re interested in. We hope our guide on choosing the best sauna heater for your needs helped you make your decision. Once you find the perfect solution for heating up your sauna, all that’s left is to indulge in the amazing benefits of your home sauna. Enjoy! Cardiovascular and Other Health Benefits of Sauna Bathing, MayoClinic.org. Did you use a sauna heater so far or are you now just looking into your first one? What’s the brand you trust the most and why? Did you get any recommendations for the best sauna heaters from friends who use them? Which features are you looking for the most in a home sauna heater? Are you a fan of the electric-powered or the gas sauna heater type? Let us know in the comment section below!